Celebrating the life of William Isaac Johnston Jr.
Obituary for William Isaac Johnston Jr.
Mr. William Isaac Johnston Jr. was born on December 16, 1955 in Stayton Oregon. His preceded in death by his parents William and Frances Johnston. He passed away peacefully on February 22, 2019. 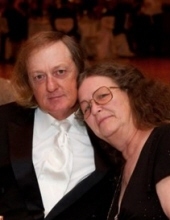 He is survived by his loving wife of 26 years Starla Jean Johnston. sons, Ronald Lakey, Aaron Lakey, William Lakey. daughters, LeeAnn Rehm and Elizabeth Aguirre. Grandchildren, Ryce Budnick, Meeghan Rehm, Keelynn Rehm, Mason Lakey, Chance Lakey, Malachi Lakey, Azlynn Sport, Olivia Lakey, William Isaac Lakey (Lil Will), Isaac Aguirre and Iris Aguirre. Sisters, Pamela Johnston Yeager, Ladonna Watts, and preceded by sister Connie Aragon. Brothers, Terry Short amd Cary Short. Mr. William was an Army Veteran @ Company C 2/505th Airborne Infantry 82nd Airborne Division on Fort Bragg NC. He lived in Bridge City Texas for almost 26 years and was a pipefitter. Mr. William Isaac Johnston Jr. will be greatly missed by all who knew and loved him. To plant a tree in memory of William Isaac Johnston Jr., please visit our Tribute Store. "Email Address" would like to share the life celebration of William Isaac Johnston Jr.. Click on the "link" to go to share a favorite memory or leave a condolence message for the family.